Primobolan is a well-known and popular steroid as well. Like nandrolone it's most often used as a base compound for stacking with other steroids. Methenolone however, is a DHT-based steroid (actually, DHB or dihydroboldenone, the 5-alpha reduced of the milder boldenon). Meaning when it interacts with the aromatase enzyme it does not form estrogens at all. That makes it ideal for use when cutting when excess estrogen is best avoided because of its retentive effects on water and fat. Methenolone is mostly only used in such instances, or by people who are very succeptible to estrogenic side-effects, because the anabolic activity of methenolone is slightly lower than that of nandrolone, quite likely BECAUSE it is non-estrogenic. Because it is a widely available steroid its often used as a replacement for nandrolone or boldenone to those who have no access to Deca-Durabolin or Laurabolin or Equipoise. When stacked with a heavy mass steroid like testosterone and/or methandrostenolone it can deliver almost similar gains. Those seeking to cut will most likely be very pleased stacking it with drostanolone, stanozolol or trenbolone. Women and beginners also stack methenolone WITH nandrolone because this gives a mildly anabolic stack that is generally regarded as one of the safer stacks around in an androgenic perspective. But alas, with the nandrolone, also a very suppressive stack. Methenolone is available as an injection or as an oral. The injection is naturally regarded as better. Its an enanthate ester which is quite long-acting and only needs to be injected once a week in doses of 300-600 mg. Because it by-passes hepatic breakdown on the first pass, it also has a higher survival rate. The orals are a lot less handy, but often preferred by bodybuilders who are afraid of needles or who are already taking one or more injectable compounds. The tabs are in a short-lived acetate form, meaning that doses of 100-150 mg per day are needed, split over 2 or 3 doses, making the tabs quite inconvenient for use. The reason doses need to be split up, unlike most oral steroids, is because Methenolone is not 17-alpha-alkylated, but 1-methylated for oral bio-availability. This reduces the liver stress, but also the availability, hence the multiple and high doses needed daily. Like nandrolone, methenolone is very mild on the system. Probably the reason why both are strongly favored as base compounds in stacks. Methenolone has no estrogenic side-effects whatsoever, on account of its structure. Its effects on the cholesterol levels are barely noticeable. In doses of 200 mg or less (injectable) blood pressure is rarely, if at all, altered. As for hepatoxicity, long-term use will of course increase liver values but gradually and only slightly. The injections of course, since they only pass the liver once, have roughly half the liver-toxic effects of the tabs. The low liver-toxicity is accounted for that the bio-availability of methenolone is carried by a 1-methyl-group, which lessens the need for a carrier attachment such as a 17-alpha-akylated group, the main culprit in steroid-related liver afflictions. The strangest thing however, taking into account that Primo is still a DHT (or rather DHB) derivative, is that it is quite easy on the system androgenically as well. Women use methenolone often, usually the tabs, and find little virilisation symptoms in short term use of methenolone. Long-term use may induce some acne and a deepening of the voice however. Methenolone is also not overly suppressive of the HPT axis (endocrinal axis for the production of natural testosterone). These are both the result of DHB's 1,2-double bond, which, analog to the parent structure boldenone, reduces the androgenic binding by 50% as opposed to DHT. For athletes who wish to maintain a "natural" status in competition, the tablets are quite well-suited as detection chances for the acetate-form are quite slim. However tests have improved and quite a number of metabolites1 of methenolone can be detected with a simple urine sample. But an English study documented that there is a liability in eating methenolone contaminated meats2, which could provide a possible defense if found out. One could always claim they ate the meat of a chicken or cow injected with methenolone since the test concluded eating such meat does not improve performance, but can deliver positive tests for several methenolone metabolites almost 24 hours after ingestion. That's for those of you seeking a viable defense against a possible methenolone-positive. Methenolone comes in orals and injectables. The injectables are to be preferred as they can be used for quite some time and only require injecting once a week. The orals are taking every day, or multiple times a day. An oral passes through the liver twice. An injectable only once. The injectable is more effective since less is broken down. Methenolone is not used all that often by experienced users. It makes a good product as an alternative to Deca or EQ in a cutting stack, because it has similar properties but does not aromatize and does not have progestagenic activity. But those at least slightly versed will prefer boldenone over methenolone as its more potent gram for gram. Its quite mild, so its not as prone to cause your standard side-effects. This too makes it quite popular with beginners. Methenolone was quite popular during the 70's in stacks with Methandrostenolone. Some of the all-time greats of bodybuilding were quite fond of this stack. The common use is similar to that of Nandrolone. 300-400 mg a week, in conjunction with other steroids mostly. Some attempt to make up for the lack of potency switching from nandrolone or boldenone to methenolone by using higher doses, in the neighbourhood of 600-800 mg a week. At that point I feel it would be cheaper to opt for boldenone at 300-400 mg a week though. Methenolone makes a poor stacking partner in mass stacks as both Deca and EQ provide better results while they are qualitatively similar. There is a slight merit in stacking Methenolone with boldenone, because apart from its 1-methyl group, methenolone is basically DHB, the 5-alpha-reduced form of boldenone. But since boldenone itself has very low affinity for 5-alpha-reduction, it should have a good synergistic effect stacking the two at 300 mg/week each. There is no use for alternate drugs since it does not aromatize, is quite mild and the gains are fairly easy to maintain, so post-cycle use of clomid or Nolvadex is not warranted. Primobolan depot is a registered trademark of Schering A/G avaiable in 50 mg/cc from Mexico and 100 mg/cc from Europe. It is is the "Cleanest and Gentles" anabolic steroid, will not aromatize, non-toxic, low in androgens. Primobolan depot may be taken by both Men and Women. Dosages for men are 100-300 mg/week, Women 1/2 dosage. Primobolan depot is the only steroid that works well on a low calorie diet. Effective for bulking, but tends to harden and add muscle tone more that build big muscles. 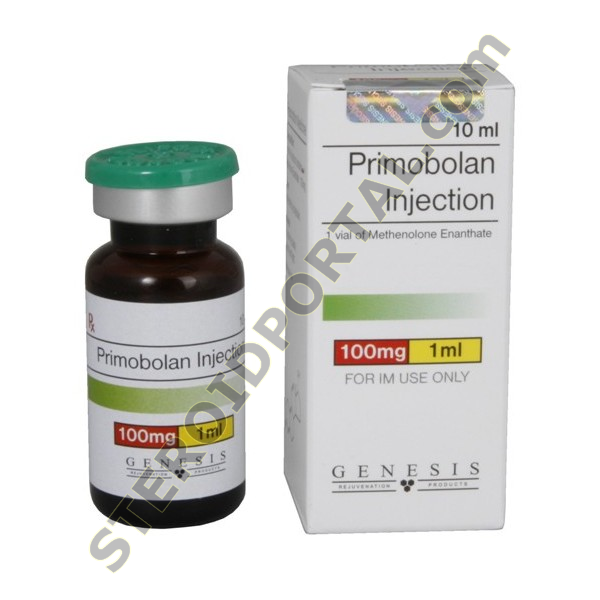 Primobolan depot works great when added to a cycle (stacked) with other steroids, it tends to lessen water retention and harshness when stacked with more heavy duty testosterone injectables, like Omnadren / Sustanon, Cypoinate / Propionate, ect. It is an analog immune-stimulating steroid used by people with Aids and others with depressed immune systems to build up the immune system and add lean muscle mass. Primobolan is one of the finest steroids in the world today. by Bill Roberts - Primobolan Depot is a Class I steroid working well at the androgen receptor but which apparently is ineffective in non-AR-mediated anabolic effects. It is most closely compared to Deca Durabolin , requiring a little higher dosage to achieve the same anabolic effect, but since it is pleasant to use at doses considerably higher than what is pleasant for nandrolone esters, it can achieve higher maximal effectiveness. That is, provided that one can afford it a gram per week of Primobolan Depot can be costly. 400 mg/week should be considered a reasonable minimum dose. It appears to cause less inhibition than Deca or testosterone for any given degree of anabolic effect, perhaps because of low CNS activity, lack of conversion to DHT, and lack of aromatization to estrogen. Unlike Deca, it is not metabolically deactivated by 5a-reductase and therefore is not as kind to the skin and hair as that drug. However, when used by itself at modest doses, by suppressing natural testosterone and DHT production, it can improve skin relative to using no anabolic steroids at all. The half-life is probably about 5 days. The drug is particularly excellent for use as the last injectable used in a cycle, since for any given anabolic effect it gives much less inhibition than other steroids such as testosterone, nandrolone, or trenbolone . Therefore, residual levels of Primobolan can allow recovery in the taper while still offering useful anti-catabolic or even anabolic support. Primobolan® Depot is the injectable version of the steroid methenolone. This of course is the same constituent in Primobolan© Orals (methenolone acetate), both produced by the firm Schering. Primobolan ® Depot is the injectable version of the steroid methenolone. This of course is the same constituent in Primobolan© Orals (methenolone acetate), both produced by the firm Schering. In this preparation, an enanthate ester is added to the steroid, which causes a slow and gradual release from the site of injection. Its duration of activity would thus be quite similar to Testosterone enanthate, with blood levels remaining markedly elevated for approximately two weeks. Methenolone itself is a long acting anabolic, with extremely low androgenic properties. On the same note the anabolic effect is also quite mild, its potency considered to be slightly less than DecaDurabolin® (nandrolone decanoate) on a milligram for milligram basis. For this reason, Primobolan is most commonly used during cutting cycles when a mass increase is not the main objective. Some athletes do prefer to combine a mild anabolic like "Primo" with bulking drugs such as Dianabol, Anadrol 50® or testosterone however, presumably to lower the overall androgen dosage and minimize uncomfortable side effects. When choosing between Primobolan preparations, the injectable is preferred over the oral for ail applications, as it is much more cost effective. Primobolan displays many favorable characteristics, most which stem from the fact that methenolone does not convert to estrogen. Estrogen linked side effects should therefore not be seen at all when administering this steroid. Sensitive individuals need not worry about developing gynecomastia, nor should they be noticing any water retention with this drug. The increase seen with Primobolan will be only quality muscle mass, and not the smooth bloat which accompanies most steroids open to aromatization. During a cycle the user should additionally not have much trouble with blood pressure values, as this effect is also related (generally) to estrogen and water retention. At a moderate dosage of 100-200mg weekly, Primobolan® should also not interfere with endogenous testosterone levels as much as when taking an injectable nandrolone or testosterone. This is very welcome, as the athlete should not have to be as concerned with ancillary drugs when the steroid is discontinued (a less extreme hormonal crash). At higher doses strong testosterone suppression may be noticed however, as all steroids can act to suppress testosterone production at a given dosage. Here of course an ancillary drug regimen may be indicated. Side effects in general are usually not much of a problem with Primobolan® Depot. There is a chance to notice a few residual androgenic effects such as oily skin, acne, increased facial/body hair growth or an aggravation of male pattern baldness condition. This steroid is still very mild however, and such problems are typically dose related. Women will in fact find this preparation mild enough to use in most cases, observing it to be a very comfortable and effective anabolic. If both the oral and injectable were available for purchase, the faster acting oral should probably be given preference however. This is simply due to the fact that blood hormone levels are more difficult to control with a slow acting injectable, the user also having to wait many days for steroid levels to diminish if side effects become noticeable. Overall, Primobolan® Depot is actually considered to be one of the safest anabolic steroids available. Steroid novices, older athletes or those sensitive to side effects would undoubtedly find it a very favorable drug to use. The typical "safe" dosage for men is 100-200mg per week, a level that should produce at least some noticeable muscle growth. In European medicine it is not uncommon for Primobolan® to be used safely at such a dosage for extended periods of time. Among athletes, men may respond to weekly doses of 200mg but regular users will often inject much higher doses looking for a stronger anabolic effect. It is not uncommon for a bodybuilder to take as much as 600 or 800mg per week (6 to 8 100mg ampules), a range which appears to be actually quite productive. Of course androgenic side effects may become more pronounced with such an amount, but in most instances it should still be quite tolerable. In addition, it is most popular for male bodybuilders to stack Primobolan® with other (generally stronger) steroids in order to obtain a faster and more enhanced effect. During a dieting or cutting phase, a non-aromatizing androgen like Halotestin® or trenbolone can be added. The strong androgenic component should help to bring about an added density and hardness to the muscles. On the other hand (or in addition) we could add Winstrol, another mild anabolic steroid. The result of this combination should again be a notable increase of muscle mass and hardness, but in this case the gain should not be accompanied by greatly increased side effects. As mentioned earlier, Primobolan® Depot is also used effectively during bulking phases of training. The addition of testosterone, Dianabol or Anadrol 50® would prove quite effective for adding new muscle mass. Of course we would have to deal with estrogenic side effects, but in such cases Primobolan® should allow the user to take a much lower dosage of the more "toxic" drug and still receive acceptable results. Women respond well to a dosage of 50-100mg per week, although (as stated above) the oral should usually be given preference. Additionally, some choose to include Winstrol® Depot (50 mg per week) or Oxandrolone (7.5l0mg daily) and receive a greatly enhanced anabolic effect. Remember though, androgenic activity can be a concern and should be watched, particularly when more than one anabolic is used at a time. If stacking, it would be best to use a much lower starting dosage for each drug than if they were to be used alone. This is especially good advice if you are unfamiliar with the effect such a combination may have on you. A popular recommendation would also be to first experiment by stacking with oral Primobolan®, and later venture into the injectable if this is still necessary. On the black market, Primobolan® is in high demand and therefore is made readily available. Virtually all forms of this injectable steroid will be packaged in 1 ml glass ampules, with each containing 100mg of the drug in Europe and 50mg in Mexico (Germany also produces a 1 ml redi-ject). Inside the U.S., the 50mg ampules from Mexico and 100mg ampules from Spain and Greece most commonly show up. 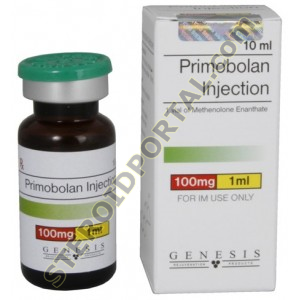 The attraction is no doubt the price, as Primobolan® is not an extremely cheap product. A single 100mg ampule will generally sell for around $15 to 20 in the United States. The 50mg ampule is usually a bit cheaper, perhaps $10 on average. Of course this is probably not as cost effective, and in worse cases this preparation will sell for about the same price as the 100mg version.